We’ve taken the hitch plate, rocker arm and cross member, and combined all three functions into our SuperLite King Pin Adapter. The adapter clamps to the trailer’s king pin and mounts an upside-down ball in place of all three. 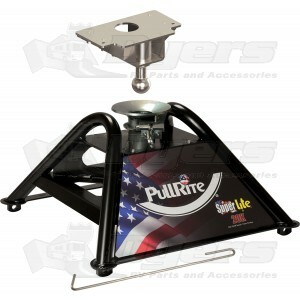 Because the ball and the coupler funnel are completely visible from the driver’s seat, SuperLite is absolutely the easiest fifth wheel hitch to couple in the industry, and the lightest at only 52 lbs. Industry standard base rails or PullRites "better then theirs" rails.